Chicago firefighters and paramedics will get more than $20 million in back pay without adding to the city’s mountain of debt under a five-year contract overwhelmingly ratified Wednesday that forfeits union givebacks for the possibility of pension reform. Earlier this year, Mayor Rahm Emanuel persuaded the City Council to double — from $500 million to $1 billion — a “commercial paper” program used to tide the city over between major bond issues. But City Hall has insisted that the more than $20 million needed to cover the back pay was tucked away into all-purpose “finance general” accounts in the mayor’s 2014 budget and that the tab would not be covered by borrowed money. The contract gives firefighters and paramedics an 11 percent pay raise over five years, maintains staffing levels and bolsters ambulance service by converting all 15 basic-life-support ambulances to advanced-life-support. But that’s among the only givebacks Emanuel was able to wring out of Local 2. The mayor came up empty on his laundry list that took aim at treasured union perks such as holiday and duty availability pay; clothing allowance; pay grades; premium pay; non-duty lay-up coverage; the physical fitness incentive; and the 7 percent premium paid to cross-trained firefighter paramedics. Nor did the union agree to Emanuel’s plan to have “double houses” that include both engines and trucks to be staffed by nine firefighters instead of 10. Next year, Chicago is required by state law to make a $600 million contribution to stabilize police and fire pension funds that have now have assets to cover just 30.5 percent and 25 percent of their respective liabilities. Emanuel wants the General Assembly to put off the balloon payment until 2023 to lift the sword hanging over Chicago taxpayers and give him time to negotiate pension reforms with police and fire unions. “If we had pushed on variances, manning or tried to go after junk pay and vacation pay, it would have ended up in interest arbitration, and the arbitrator would find an offset for it. We would have had to give up something else,” said a source familiar with the agreement. Mayor Rahm Emanuel’s former comptroller, Amer Ahmad, has admitted in court in Pakistan that he forged documents to flee overseas. But he will not be getting a slap on the wrist anytime soon for making a fake Pakistani National Identity Card and birth certificate, an official in the South Asian country said. Ahmad, who fled to his parents’ homeland this spring, had his bail application for the crimes rejected by a judge in Lahore this week, according to Usman Anwar, the Punjab region director for the Federal Investigation Agency, Pakistan’s version of the FBI. He is “pleading guilty and asking for [a] fine as punishment,” Anwar said in an email to the Sun-Times. However, the FIA has maintained that under the law, Ahmad can be penalized with fines and prison time as well and argued that he should not be granted bail. Ahmad, 39, was arrested in Pakistan in late April with a fake Mexican passport, a forged Pakistani visa and thousands of dollars in an apparent attempt to avoid prison time for the fraud he committed while he was Ohio’s deputy state treasurer. In December, Ahmad had pleaded guilty to being part of a large kickback and money-laundering scheme. Ahmad had been free pending his sentencing and had continued to live in Chicago since resigning from his $165,000-a-year City Hall post last summer. He was forced to surrender his passport and was facing up to 15 years in prison and restitution of $3.2 million. While on the lam, Ahmad kept a diary of his time on the run, detailing how he was able to get the fake documents after crossing the U.S.-Mexico border by foot. Chicago Public Schools’ chief financial officer is stepping down to take a new job about a month before the district may have to lay off thousands of staffers for financial reasons. Ginger Ostro, who came to CPS in 2011 as a budget officer and was elevated to CFO in June 2014, will lead the education policy group Advance Illinois as of Jan. 4. CEO Forrest Claypool has warned of deep cuts and up to 5,000 layoffs by Feb. 8 if Springfield fails to enact pension changes. Ostro did not respond to requests seeking comment. Chicago Public Schools on Tuesday laid out plans to combine several schools and to close two others: a military program that exists in name only and a building that once housed a district-operated program for students with special needs. The city in 2013 placed a five-year moratorium on school closings after Mayor Rahm Emanuel's administration shuttered nearly 50 schools. A district spokeswoman said Tuesday that "no students or teachers are affected by either of the actions at Montefiore or Marine, which is what the moratorium was designed to address. "The moratorium was meant to ease the public's concerns about year over year disruptions to students, while these actions clarify the status of schools that had no students." Two community hearings and a public hearing will be held for each proposed change. Chicago Public Schools, the third-largest school system in the United States, is facing what has been described as a budget disaster. However, the word “disaster” is a misnomer. An avalanche is a disaster. A volcano is a disaster. The natural world produces disasters as sudden events with unexpected outcomes. This decades-long, wholly predictable crisis is entirely man-made. CPS is insolvent. With about 392,000 students, 32,000 public school staff and a budget of $5.5 billion, CPS spends about 70 percent of its budget on salaries and benefits. In fiscal 2015, pension contributions consumed about 11 percent of the operating budget. The payments into the pension system have been inadequate for years. The size and scope of the problem threaten the education and development of Chicago's schoolchildren—the workers, thinkers and innovators of tomorrow. This year's CPS budget “balances” on an anticipated special revenue payment of $480 million from the state Legislature. This assumption is incredulous, since the state has failed to pass its own budget for five months. It is unconscionable that a city of Chicago's stature could not have anticipated a monetary shortfall of this size—and that the proposed solution is an unprecedented discharge of almost half a billion dollars from the state treasury. The Illinois General Assembly should pass, and the governor should sign, a bill that enables municipalities to file a Chapter 9 petition of the U.S. Bankruptcy Code. If the CPS petition was affirmed, the district would get a stay from creditors, and the purpose of the school system—educating the citizens of Chicago—could continue. Meanwhile, a rationalization of CPS revenue and expenses could begin. They're blocking copy/paste on the doc and I don't feel like typing it up. The attached memo dated Friday was released by CPS regarding its near term cash crunch. Look for an applet called "allow text selection." It works! Some investors extended their caution to Chicago, the only big city besides Detroit that Moody's deems junk. Some of its securities fell by more than 10 cents on the dollar in less than a week after the May downgrade, on speculation that Chicago would face a liquidity crisis because the rating cut exposed it to as much as $2.2 billion of payments to banks if it couldn't refinance its debt. Pimco saw it as a buying opportunity. The high-yield fund took a $9 million position in general obligations due in 2033 that the city issued in July, making it the fund's sixth-largest single holding by Sept. 30, Bloomberg data show. The debt priced at 98.5 cents on the dollar to yield 5.64 percent. It last traded in October at 103.6 cents to yield 5 percent. Chicago avoided a cash squeeze by refinancing. The securities went on to rally after Mayor Rahm Emanuel in October pushed through the biggest property-tax increase in the city's history -- $543 million over the next four years -- to help pay the pension-fund bills at the root of the its distress. Emanuel, a Democrat who won re-election in 2015, had resisted raising the levy for years even though it was lower than surrounding localities. "Our view was that we would get a property-tax increase out of Chicago, that it would go a long way in beginning to address their fiscal imbalances when it comes to underfunded pension liabilities, and that the market would reward Chicago for demonstrating that they have not just the ability but the willingness to raise revenues," Hammer said. While the city has challenges ahead, the property-tax increase "does fundamentally improve their credit outlook," Hammer said. Dec 21 Moody's Investors Service on Monday dropped the Chicago Board of Education's credit rating deeper into "junk" territory, citing the public school district's "precarious liquidity position." The rating on $5.5 billion of the district's general obligation debt was lowered to B1 from Ba3, and Moody's warned that it is under review for a further downgrade. The Chicago Public Schools "has increasingly relied on market access and cash flow borrowing to maintain ongoing operations," the credit rating agency said in a statement, adding that the downgrade also reflects the district's structurally imbalanced fiscal 2016 budget. The nation's third-largest public school district is facing a cash shortfall next month and has approved new short- and long-term borrowings to raise operating funds. The district's $5.7 billion budget could also spring a $480 million hole if the state of Illinois does not substantially beef up its share of pension funding for the district, the state's biggest. But help for the district remains entangled in an ongoing budget impasse between Republican Governor Bruce Rauner and Democrats who control the legislature. For its pension, CPS is budgeted to contribute about $675 million this year, with big increases thereafter, most of which is applied against the unfunded liability already accrued. That’s currently 28% of its roughly $2.4 billion payroll. In the private sector, an employer would typically contribute roughly 6% of salary towards a retirement plan. So, if CPS was doing the same it would be contributing $144 towards retirement instead of that $675 million it now pays. It would therefore save $531 million on pension expense. For bonded debt, total annual payments on it are about $540 million (about 8% of its budget), and they are projected to stay around that for the near term, as shown in the chart on the right. The total outstanding balance on all bonds is about $6.3 billion, according to CPS’s 2016 budget. Wipe out all that debt service and add it to the pension savings and you get $1.07 billion, just a tad short of the budget deficit. The problem, however, is that cuts nearly that large aren’t feasible. Even my fellow pension critics would agree, I think, that total cancellation of the unfunded pension liability would be far too harsh. Officially, CPS’s pension is about 50% funded. (We wrote here last week about its most recent actuarial report.) In bankruptcy, that number is likely to be revised significantly for the worse, as happened in the Detroit bankruptcy. CPS’s unfunded portion could well rise to 75%. Cancelling that debt entirely would mean pensioners get just 25% of what they were promised. Nor is cancelling all bonded debt feasible. Some of it is secured, which must be paid in full. Even unsecured debt is supposed to be paid on a parity with unfunded pensions and other unsecured debt. That’s based on the letter of Chapter 13, though, in practice, larger haircuts can be expected for bondholders, as happened in Detroit. Still, some degree of equality would have to be maintained and bondholders would be represented aggressively, so giving something substantially more than zero to pensions implies something for bondholders, too. 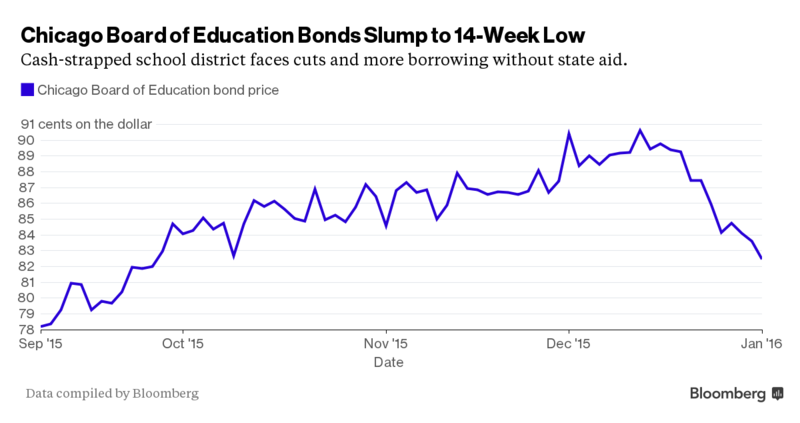 Chicago Board of Education bonds tumbled to the lowest since September as Illinois Governor Bruce Rauner said he wouldn’t bail out the cash-strapped school system. The public school system known as CPS has said it needs $480 million from the state to close a budget gap and will face cuts and “unsustainable” borrowing without the funds. Chicago Mayor Rahm Emanuel and CPS Chief Executive Officer Forrest Claypool have called for the help, saying the system receives less state money than other Illinois districts. CPS is the only state district that pays for its teachers pensions. Rauner has said he’ll help out only if Emanuel supports structural changes that he has proposed such as limits on collective bargaining. Chicago will head to the municipal bond market next week with a $500 million bond issue amid uncertain pension funding requirements and political turmoil. The general obligation refunding bonds are scheduled to be priced through Citigroup on Jan. 12, according to bond sale documents released late on Tuesday. The sale comes as state legislative fixes to address Chicago's $20 billion unfunded pension liability remain up in the air and Mayor Rahm Emanuel struggles with political fallout from controversial police shootings, including calls for his resignation. Chicago's current budget relies on a bill passed by the Illinois House and Senate that would reduce city payments to its pension funds covering police and fire fighters. The bill has not been sent to Governor Bruce Rauner, who has been critical of the measure. A record $543 million phased-in property tax increase approved by the city council in October exclusively for public safety worker pensions would still leave Chicago with a funding gap of about $200 million if that bill is not enacted. Standard & Poor's warned last week that Chicago's BBB-plus bond rating could fall "multiple notches" if the city fails "to successfully implement contingency plans in a timely manner to fully meet its pension obligations with an identifiable and reliable revenue source." The city's bond rating with Moody's Investors Service is already in the "junk" level.